This childhood story of Oliver Cromwell was published in Hawthorne's, True Stories from History and Biography (1851). Young Cromwell taught Prince Charles a lesson involving a bloody nose, which had he remembered and not continued to act superior to all, might have avoided being overthrown as king. Not long after King James the First took the place of Queen Elizabeth on the throne of England, there lived an English knight at a place called Hinchinbrooke. His name was Sir Oliver Cromwell. He spent his life, I suppose, pretty much like other English knights and squires in those days, hunting hares and foxes, and drinking large quantities of ale and wine. The old house in which he dwelt, had been occupied by his ancestors before him, for a good many years. In it there was a great hall, hung round with coats of arms, and helmets, cuirasses and swords which his forefathers had used in battle, and with horns of deer and tails of foxes, which they or Sir Oliver himself had killed in the chase. 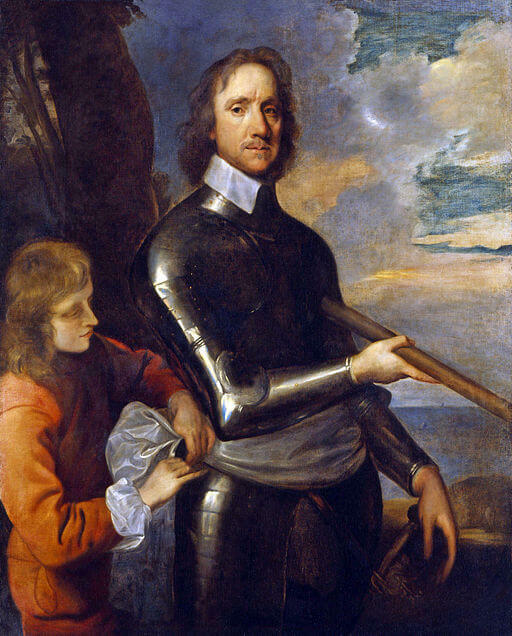 This Sir Oliver Cromwell had a nephew, who had been called Oliver, after himself, but who was generally known in the family by the name of little Noll. His father was a younger brother of Sir Oliver. The child was often sent to visit his uncle, who probably found him a troublesome little fellow to take care of. He was forever in mischief, and always running into some danger or other from which he seemed to escape only by miracle. Even while he was an infant in the cradle a strange accident had befallen him. A huge ape which was kept in the family, snatched up little Noll in his forepaws and clambered with him to the roof of the house. There this ugly beast sat grinning at the affrighted spectators, as if he had done the most praiseworthy thing imaginable. Fortunately, however, he brought the child safe down again; and the event was afterwards considered an omen that Noll would reach a very elevated station in the world. One morning, when Noll was five or six years old, a royal messenger arrived at Hinchinbrooke, with tidings that King James was coming to dine with Sir Oliver Cromwell. This was a high honor to be sure, but a very great trouble; for all the lords and ladies, knights, squires, guards, and yeomen, who waited on the king, were to be feasted as well as himself; and more provisions would be eaten, and more wine drunk, in that one day, than generally in a month. However, Sir Oliver expressed much thankfulness for the king's intended visit, and ordered his butler and cook to make the best preparations in their power. So a great fire was kindled in the kitchen; and the neighbors knew by the smoke which poured out of the chimney, that boiling, baking, stewing, roasting, and frying, were going on merrily. By and by the sound of trumpets was heard, approaching nearer and nearer; and a heavy, old-fashioned coach, surrounded by guards on horseback, drove up to the house. Sir Oliver, with his hat in his hand, stood at the gate to receive the king. His Majesty was dressed in a suit of green, not very new; he had a feather in his hat, and a triple ruff round his neck; and over his shoulder was slung a hunting horn, instead of a sword. Altogether, he had not the most dignified aspect in the world; but the spectators gazed at him as if there was something superhuman and divine in his person. They even shaded their eyes with their hands, as if they were dazzled by the glory of his countenance. "How are ye, man?" cried King James, speaking in a Scotch accent; for Scotland was his native country. "By my crown, Sir Oliver, but I am glad to see ye!" The good knight thanked the king, at the same time kneeling down, while his Majesty alighted. When King James stood on the ground, he directed Sir Oliver's attention to a little boy, who had come with him in the coach. He was six or seven years old, and wore a hat and feather, and was more richly dressed than the king himself. Though by no means an ill-looking child; he seemed shy, or even sulky; and his cheeks were rather pale, as if he had been kept moping within doors, instead of being sent out to play in the sun and wind. "I have brought my son Charlie to see ye," said the king. "I hope, Sir Oliver, ye have a son of your own, to be his playmate?" Sir Oliver Cromwell made a reverential bow to the little prince, whom one of the attendants had now taken out of the coach. It was wonderful to see how all the spectators, even the aged men, with their gray beards, humbled themselves before this child. They bent their bodies till their beards almost swept the dust. They looked as if they were ready to kneel down and worship him. The poor little prince! From his earliest infancy not a soul had dared to contradict him; everybody around him had acted as if he were a superior being; so that, of course, he had imbibed the same opinion of himself. He naturally supposed that the whole kingdom of Great Britain and all its inhabitants, had been created solely for his benefit and amusement. This was a sad mistake; and it cost him dear enough after he had ascended his father's throne. "What a noble little prince he is!" exclaimed Sir Oliver, lifting his hands in admiration. "No, please your Majesty, I have no son to be the playmate of his Royal Highness; but there is a nephew of mine, somewhere about the house. He is near the prince's age, and will be but too happy to wait upon his Royal Highness." "Send for him, man! send for him!" said the king. But, as it happened, there was no need of sending for Master Noll. While King James was speaking, a rugged, bold-faced, sturdy little urchin thrust himself through the throng of courtiers and attendants, and greeted the prince with a broad stare. His doublet and hose (which had been put on new and clean in honor of the king's visit) were already soiled and torn with the rough play in which he had spent the morning. He looked no more abashed than if King James were his uncle, and the prince one of his customary playfellows. This was little Noll himself. "Here, please your Majesty, is my nephew," said sir Oliver, somewhat ashamed of Noll's appearance and demeanor. "Oliver, make your obeisance to the king's Majesty!" The boy made a pretty respectful obeisance to the king; for, in those days, children were taught to pay reverence to their elders. King James, who prided himself greatly on his scholarship, asked Noll a few questions in the Latin Grammar, and then introduced him to his son. The little prince in a very grave and dignified manner, extended his hand, not for Noll to shake, but that he might kneel down and kiss it. "Nephew," said Sir Oliver, "pay your duty to the prince." "I owe him no duty," cried Noll, thrusting aside the prince's hand, with a rude laugh. "Why should I kiss that boy's hand?" All the courtiers were amazed and confounded, and Sir Oliver the most of all. But the king laughed heartily, saying that little Noll had a stubborn English spirit, and that it was well for his son to learn betimes what sort of a people he was to rule over. So King James and his train entered the house; and the prince, with Noll and some other children, was sent to play in a separate room while his Majesty was at dinner. The young people soon became acquainted; for boys, whether the sons of monarchs or of peasants, all like play, and are pleased with one another's society. What games they diverted themselves with, I cannot tell. Perhaps they played at ball—perhaps at blindman's buff—perhaps at leap-frog—perhaps at prison-bars. Such games have been in use for hundreds of years; and princes as well as poor children have spent some of their happiest hours in playing at them. Meanwhile, King James and his nobles were feasting with Sir Oliver, in the great hall. The king sat in a gilded chair, under a canopy, at the head of a long table. Whenever any of the company addressed him, it was with the deepest reverence. If the attendants offered him wine, or the various delicacies of the festival, it was upon their bended knees. You would have thought, by these tokens of worship, that the monarch was a supernatural being; only he seemed to have quite as much need of those vulgar matters, food and drink, as any other person at the table. But fate had ordained that good King James should not finish his dinner in peace. All of a sudden, there arose a terrible uproar in the room where the children were at play. Angry shouts and shrill cries of alarm were mixed up together; while the voices of elder persons were likewise heard, trying to restore order among the children. The king, and everybody else at table, looked aghast; for perhaps the tumult made them think that a general rebellion had broken out. "Mercy on us!" muttered Sir Oliver; "that graceless nephew of mine is in some mischief or other. The naughty little whelp!" Getting up from table, he ran to see what was the matter, followed by many of the guests, and the king among them. They all crowded to the door of the play-room. On looking in, they beheld the little Prince Charles, with his rich dress all torn, and covered with the dust of the floor. His royal blood was streaming from his nose in great abundance. He gazed at Noll with a mixture of rage and affright, and at the same time a puzzled expression, as if he could not understand how any mortal boy should dare to give him a beating. As for Noll, there stood his sturdy little figure, bold as a lion, looking as if he were ready to fight not only the prince, but the king and kingdom too. "You little villain!" cried his uncle. "What have you been about? Down on your knees, this instant, and ask the prince's pardon. How dare you lay your hands on the king's Majesty's royal son?" "He struck me first," grumbled the valiant little Noll; "and I've only given him his due." Sir Oliver and the guests lifted up their hands in astonishment and horror. No punishment seemed severe enough for this wicked little varlet, who had dared to resent a blow from the king's own son. Some of the courtiers were of opinion that Noll should be sent prisoner to the Tower of London, and brought to trial for high treason. Others, in their great zeal for the king's service, were about to lay hands on the boy, and chastise him in the royal presence. But King James, who sometimes showed a good deal of sagacity, ordered them to desist. "Thou art a bold boy," said he, looking fixedly at little Noll; "and, if thou live to be a man, my son Charlie would do wisely to be friends with thee." "I never will!" cried the little prince, stamping his foot. "Peace, Charlie, peace!" said the king; then addressing Sir Oliver and the attendants, "Harm not the urchin; for he has taught my son a good lesson, if Heaven do but give him grace to profit by it. Hereafter, should he be tempted to tyrannize over the stubborn race of Englishmen, let him remember little Noll Cromwell, and his own bloody nose!" So the king finished his dinner and departed; and, for many a long year, the childish quarrel between Prince Charles and Noll Cromwell was forgotten. The prince, indeed, might have lived a happier life, and have met a more peaceful death, had he remembered that quarrel, and the moral which his father drew from it. But, when old King James was dead, and Charles sat upon his throne, he seemed to forget that he was but a man, and that his meanest subjects were men as well as he. He wished to have the property and lives of the people of England entirely at his own disposal. But the Puritans, and all who loved liberty, rose against him, and beat him in many battles, and pulled him down from his throne. Throughout this war between the king and nobles on one side, and the people of England on the other, there was a famous leader, who did more towards the ruin of royal authority, than all the rest. The contest seemed like a wrestling-match between King Charles and this strong man. And the king was overthrown. When the discrowned monarch was brought to trial, that warlike leader sat in the judgment-hall. Many judges were present, besides himself; but he alone had the power to save King Charles, or to doom him to the scaffold. After sentence was pronounced, this victorious general was entreated by his own children, on their knees, to rescue his Majesty from death. "No!" said he sternly. "Better that one man should perish, than that the whole country should be ruined for his sake. It is resolved that he shall die!" When Charles, no longer a king, was led to the scaffold, his great enemy stood at a window of the royal palace of Whitehall. He beheld the poor victim of pride, and an evil education, and misused power, as he laid his head upon the block. He looked on, with a steadfast gaze, while a black-veiled executioner lifted the fatal axe, and smote off that anointed head at a single blow. "It is a righteous deed," perhaps he said to himself. "Now Englishmen may enjoy their rights." At night, when the body of Charles was laid in the coffin, in a gloomy chamber, the general entered, lighting himself with a torch. Its gleam showed that he was now growing old; his visage was scarred with the many battles in which he had led the van; his brow was wrinkled with care, and with the continual exercise of stern authority. Probably there was not a single trait, either of aspect or manner, that belonged to the little Noll, who had battled so stoutly with Prince Charles. Yet this was he! He lifted the coffin-lid, and caused the light of his torch to fall upon the dead monarch's face. Then, probably, his mind went back over all the marvellous events, that had brought the hereditary king of England to this dishonored coffin, and had raised himself, an humble individual, to the possession of kingly power. He was a king, though without the empty title, or the glittering crown. "Why was it," said Cromwell to himself—or might have said—as he gazed at the pale features in the coffin,—"Why was it, that this great king fell, and that poor Noll Cromwell has gained all the power of the realm?" And, indeed, why was it? King Charles had fallen, because, in his manhood the same as when a child, he disdained to feel that every human creature was his brother. He deemed himself a superior being, and fancied that his subjects were created only for a king to rule over. And Cromwell rose, because, in spite of his many faults, he mainly fought for the rights and freedom of his fellow-men; and therefore the poor and the oppressed all lent their strength to him. "Dear father, how I should hate to be a king!" exclaimed Edward. "And would you like to be a Cromwell?" inquired his father. "I should like it well," replied George, "only I would not have put the poor old king to death. I would have sent him out of the kingdom, or perhaps have allowed him to live in a small house, near the gate of the royal palace. It was too severe, to cut off his head." "Kings are in such an unfortunate position," said Mr. Temple, "that they must either be almost deified by their subjects, or else be dethroned and beheaded. In either case it is a pitiable lot." "Oh, I had rather be blind than be a king!" said Edward. "Well, my dear Edward," observed his mother, with a smile, "I am glad you are convinced that your own lot is not the hardest in the world." If you enjoyed this story, you might like to read Hawthorne's Benjamin Franklin and Sir Isaac Newton. For other interesting biographies, visit American Biographies for Kids. Add Oliver Cromwell to your own personal library.